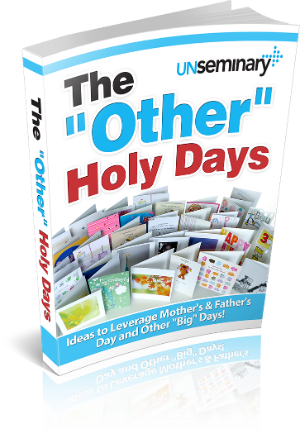 How do churches celebrate the “other” holy days? Father’s day is huge for us! We have Father Fest. We have a bacon bar on sunday morning, after church we have games where dad’s can compete, we grill steaks for dad’s and everyone else can have hotdogs and burgers. We start a new series that focuses on what it takes to be a biblical man, ManCard this year. Gave away a housecleaning in each service. Created a man cave area for dads and kids to go and wait. Snacks and either a game on or Duck Dynasty (depending on day/time of service). Mother’s Day is big. We honor moms and make a big deal. We pray for them and then we specifically honor single moms. We pray for them and then have our people bless them financially in the service by giving the. Money. Very powerful. People cry all over the place. We have a Bread Communion for Thanksgiving, in which people bring bread from their own ethnic heritage. Lifts of the diversity among us and gratitude for our myriad traditions. Next year, we are planning a racial reconciliation day on MLK Day as part of our attempt to give a picture to our community (racially charged) of what that means for the Body of Christ. Every year, we celebrate our volunteers during a Volunteer Appreciation Sunday. We make (funny as well as serious) certificates for committee chairs and other special volunteers, and always have an “unsung hero” award. The board members bring – and serve – all the food for the potluck on that Sunday. Does the “unsung hero” award include a certificate or a trophy or something like that? Great stuff … thanks for sharing.